New York Comicon (NYCC) 2018 is officially on the books. We gathered in New York City to share creative ideas with the next generation of comic book creators. This year the educational panels were featured on Thursday, but we still managed to pack the room to talk about making comics. 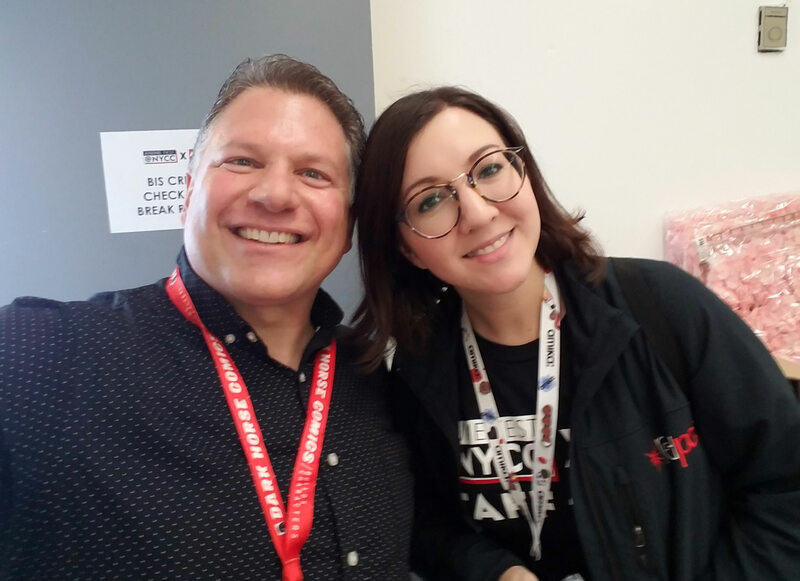 Thank you to Katie Ruark of ReedPop for giving us the stage at NYCC to bring you these educational panel. Without ReedPop’s support, none of this would be possible. And, of course, thank you to my hard-working team at here at Comic Book School. All of your pre-show and at-show work makes our panels run smoothly. Thank you to the friends who took vacation days to join me on this annual adventure including Janet Scalera, Nicole Scalera, Danielle Scalera, Liam Devine, James McGill, Glenn Herdling, Marcelo Ferreira, Michael Dolce and the rest of ya’ll. A big thank you to Grant Shorter for redesigning the look and feel of Comic Book School. All of the CBS graphics you see here have been designed by Grant. Thank you to our sponsor Marvy Uchida for their ongoing support. Established creators and the next wave of creators all appreciate the markers that you generously share at our panels. You make the world a more colorful place. Thank you to our newest sponsor General Pencils for providing high-quality drawing tools for our creators. We’re excited to be using your pencils and erasers. Thank you to Lysa Hawkins, Editor at Valiant Entertainment, Joe Rybandt, Editorial Director at Dynamite Entertainment, and Jimmy Palmiotti of PaperFilms for our “Editors on Editing” panel. You can see from the photos how many people had questions for our panelists. Thanks to Sean Chen (Artist, Iron Man, Wolverine, X-O Manowar, Bloodshot), Jerry Ordway (Superman, Shazam), Terry Moore (Strangers in Paradise, Rachel Rising), Jamal Igle (Supergirl, Molly Danger), and Tim Seeley (Hack/Slash, Batman) for our “Storytelling on the Page for Artists & Writers” panel. Thank you to everyone for making “Creator Connection” a rousing success at NYCC. This is event only works when people participate. There’s nothing better than seeing people take the stage to talk about how they are creating comics based on the relationships they made at “Creator Connection.” It’s great to be part of a community that is making comics. Plus, a big shout out to the creators who join us every comic book convention to offer words of inspiration before our networking session. And then there are a few photos that I took at the con. Fun stuff below. This trailer features “Apocalypse Blvd” a new comic book series by Donny Hadiwidjaja and me (Buddy Scalera). Big thanks to Intern #1 Arielle Lupkin for this outstanding video. We love it! What a great day at #NYCC!! Saw lots of great cosplayers, really cool Mad Cave fans stopped by and ended the day at the #MakeComics: Editors on Editing panel 邏. Awesome editors and audience. Thanks to @ComicBookSchool and@NY_Comic_Con for these panels! The powers that be @NY_Comic_Con need to know that for many of us, this is the most important panel of the show. @ComicBookSchool resources compiled & written by @BuddyScalera are great for novice & seasoned pro. His friends & colleagues have conveyed their knowledge to make this essential for those #makingcomics! Personally, they’ve saved me hundreds of hours to put back in my work!